POLAR STAR supplies a full range of commercial and domestic ice makers machines from most leading manufacturers such as Manitowoc, Scotsman, Hoshizaki, Ice-O-Matic, and Whirlpool. We also supply accessories for ice making makers machines including water filters, sanitizers and cleaners, ice baggers, and more. Depending on business type and daily ice production required, you can choose specific ice making makers machine and ice type so that you will maximize and profit and usage of your ice maker and minimize cost and maintenance. 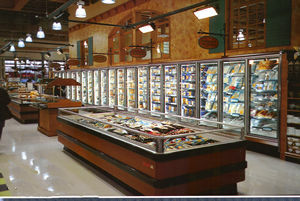 In supermarket, flake or nugget ice makers is the solution for fresh seafood, deli counter, fruit and vegetable displays and cube ice for in-store delis. Different manufacturer offers different ice forms and sizes for different applications. To meet the requirements of health care facilities, choose from a wide variety of ice makers machine forms to meet your specific needs. Nugget ice is preferred for patient care because it's soft and chewable, so it doesn't present the choking risk of cubed ice makers machines; and because nugget ice makers machines melts slowly and doesn't clump, ice bags remain functional and moldable for a very long time. Chiplets are larger irregular shapes of hard compacted flake ice with an approximate ice size of 3/4" x 3/4" x 3/16". 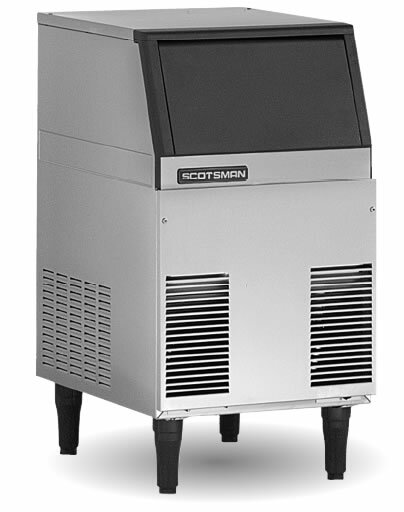 Another recommendation for health care facility, Scotsman's MDT Series, this ice maker/dispensers provide a convenient and sanitary method of dispensing ice and water. These countertop units store from 12 to 90 lbs. of ice and are available with either lever actuation or with Scotsman's unique infrared sensor (Touchfree provides convenient one-hand operation and eliminates the risk of cross contamination) actuation to dispense ice and water perfectly and reliably every time. For nightclub and bars, the Manitowoc QuietQube® Series ice machines are the perfect solution for bringing large volumes of ice into the front room without all the noise and heat. Manitowoc QuietQube remote system ice maker is 75% quieter than the rest. These models use an exclusive, technology that put the compressor and condenser fan motor on the roof. This Patented CVD technology uses cool vapor rather than hot gas to harvest ice. Manitowoc's marine model ice cube machines (water-cooled models) have a stainless steel exterior, internal frame and bulkhead to address corrosion concerns. It also features water-proof control box housing, compressor ground wire, and rugged, corrosion-free base. Manitowoc's correctional model ice cube machines are available in both air and water-cooled models. Correctional models have no removable plastic on the outside of the machine, stainless steel top, back and front panels, and tamper-proof screws for both front panel and back cover which require a special tool for removal.